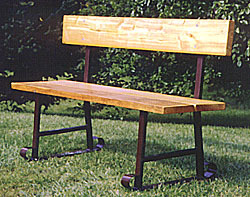 A rugged , sturdy bench that will take abuse, yet very simple to assemble. Wide bolt plate provides rigid connection to seat boards. Use three pieces of standard 2" x 8" lumber, six to eight foot length recommended' longer one-piece benches may be assembled merely by adding extra frames.